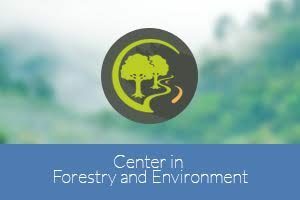 The Research Centre for Forestry and Environment was established in 2016 to conduct high quality research projects in forestry and environment sectors by the academic members of the Department of Forestry and Environmental Science with the collaboration of the researchers in other departments of the University of Sri Jayewardenepura and research institutes in Sri Lanka and other countries when necessary. The facilities given to the proposed centre are also used to further train the students of the Department at BSc, MSc, MPhil and PhD levels in high quality research. The uniqueness of this centre is the capability of bringing many researchers into a single team so that they can undertake the tasks which may not be able complete by one or two persons. Since the forestry and environment sectors cover a vast area facing immense problems at present, such collaboration is necessary to achieve better results which are useful for the betterment of the country. The vision of the Research Centre for Forestry and Environment (CFE) of the Department of Forestry and Environmental Science is to be the leading academic organization to advance and facilitate high standards of research seeking for the solutions for the problems faced by forestry and environment sectors at regional, national and global scales. The mission of the CFE is to conduct research on forest and environmental problems facing the nation and world; to increase the knowledge dissemination; to enhance the status of the university by publishing the findings in high quality journals; to provide a mechanism whereby existing research capabilities in the department and university to be matched with funding sources; to contribute to the university’s graduate and undergraduate programs by involving students in research projects through assistantships and other work arrangements. As part of its mission, the Centre also recognizes the importance of combining expertise and capacities of multiple institutions, disciplines and professions in addressing complex problems. The CFE has been started in mid-2016 and currently it uses the laboratory and equipment facilities at the Department of Forestry and Environmental Science. Subasinghe S.M.C.U.P., Withanage S.V., Fernando T.H.P.S. (2017) Impacts of selected fungal toxins on the inducement of agarwood in Gyrinops walla. Proceedings of 22nd International Forestry and Environment Symposium, University of Sri Jayewardenepura, p 55.
de Alwis W.N.H., Subasinghe S.M.C.U.P., Hettiarachchi D.S. (2017) Variation of chemical compounds of naturally and artificially formed agarwood resins in Gyrinops walla. Proceedings of 22nd International Forestry and Environment Symposium, University of Sri Jayewardenepura, p 66. Vidurangi A.N.G.C.K., Subasinghe S.M.C.U.P., Fernando K.M.E.P. (2017) Isolation of associated fungal species in Aquilaria and Gyrinops species of family Thymelaeaceae. Proceedings of 22nd International Forestry and Environment Symposium, University of Sri Jayewardenepura, p 67 Kannangara D.N., Ranathunge R.M.T.B., Abeyewickreme W., Hapugoda M.D., Subasinghe S.M.C.U.P. (2017) Impacts of meteorological parameters on the abundance of malaria vector in Batticaloa District, Sri Lanka. Proceedings of 22nd International Forestry and Environment Symposium, University of Sri Jayewardenepura, p 79. Malithi R.A.P., Subasinghe S.M.C.U.P., Fernando T.H.P.S. (2017) Potential of making fungal toxins at commercial scale for agarwood inducement. Proceedings of 22nd International Forestry and Environment Symposium, University of Sri Jayewardenepura, p 68. Weerasinghe W.M.M., Subasinghe S.M.C.U.P., Hettiarachchi D.S. (2017) Variation of volatile oil contents and constituents in lesser known plant species for formulating mosquito repellents. Proceedings of 22nd International Forestry and Environment Symposium, University of Sri Jayewardenepura, p 69. Chandrathilake GGT, Tanaka N, Kamata N. (2016). Transpiration response of neighboring trees to the wilting of oak individuals prone to Japanese oak wilt disease. Proceedings of 62nd Annual Meeting of the Ecological Society of Japan. None as full papers, but the abstracts mentioned in 2.2 above have been published as Conference Proceedings.